Just a simple question. Can any currently planned commercial vehicle (with one or more launches) plan and complete a Hubble repair mission? I am looking forward to JWST as the next person but giving up such a still relevant instrument seems terrible to me. Any clues? Hubble was outfitted with a passive LIDS interface and a set of laser retroreflectors during STS-125, so technically any of the commercial crew vehicles (Dragon, CST-100, Dream Chaser, and the Blue Origin vehicle) can rendezvous and dock with it. Actually being able to perform a *useful* servicing mission is another matter. If any of the above vehicles can support standalone EVAs, that capability is certainly not being advertised yet. Only Dragon has any unpressurized cargo space for replacement instruments, and without a robotic arm, installation would be highly impractical. In my opinion, an (as-yet unproposed) mission module would have to be developed and launched separately to provide said capabilities in order for any of these vehicles to perform a useful servicing mission. I'm not sure if any of the Commercial Crew vehicles support EVA. 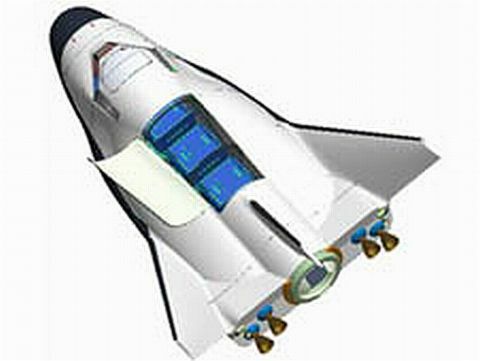 There were rumors of a possible EVA and robotic arm capability for the Dream Chaser. Those weren't rumors. Mark Sirangelo was talking about possible future variants. I finally managed to convert this file. Its from 2010, so some things are obsolete. As you can see (pp.15-24), SpaceX has given servicing missions some thought. Thanks for that! Very interesting. Ya this was pretty much what I had in mind, glad to see someone has put some thought into it at least. As mentioned earlier SNC has said they intend Dream Chaser be used for servicing too, but I've not seen any details. Has anyone else? + The DC's rear tunnel seems about the right size for a 1 person air lock. By contrast, Dragon needs to be depressurized/repressurized entirely for EVA. So, basically the same as Dragon except you have crewmembers supporting the EVA inside a pressurized vehicle - as happens with ISS EVAs - rather than while in their own EVA gear. Right, but with DC where would the new and old instruments go? It's a problem. That's where Dragon has the edge. 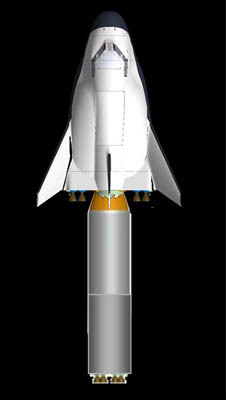 I initially thought that DC's Upper Stage fairing/adapter could be enlarged and converted into a Dragon-like trunk. Perhaps the aero-fairing would be jettisoned to save weight (like the Orion SM panels.) Unpressurized spares would be attached to this structure. If needed, solar panels could be attached here too. The big problem with this is the OMS engines fire back into this area. Even speculative solutions to this sound nuts: Hinge the cargo structure to the side out of the way? Found these SpaecDev pics in my image collection, downloaded from the NASA CC pages. Low-res, but the idea comes through loud and clear. Found these SpaeDev pics in my image collection, downloaded from the NASA CC pages. Lor-es, but the idea comes through loud and clear. Yes it does! Any clue as to what the crew capacity would be with this configuration? No clue. They're old images showing 4 engines vs. the current 2, and the long-gone hybrid upper stage. Still - I would think with a composite pressure vessel a cabin hatch and payload bay could be rapidly prototyped for a "Servicing Dream Chaser". Rampant speculation: 2-4 seats, bulkhead with unpressurized cargo bay, a mini-MDA supplied arm & no rear docking adapter needed? I still think the hybrid engines are a sort of tacky solution that won't live that long once (if) DC actually starts flying. A brace of SuperDraco's on either side would give it a kick in the gas, but that'll probably never happen. There are other aerospace companies out there besides SpaceX. I know - but it's hypergolic and in the thrust range to be an abort motor. What are the other options? Thanks for this website, didn't know it existed! Wonderful knowledge source.